How gorgeous is the new Rainbow apparition 1 seconde nail enamel from Bourjois Paris? For a glitter polish, it's surprisingly pigmented. The above photo shows 2 coats and you can see it's enough to hide my nail line. The polish also works well as a sheer top coat and I can't wait to try it over a lilac or purple shade. Rainbow apparition will be priced at £5.99 and will be available at Boots/Superdrug from June 2012. 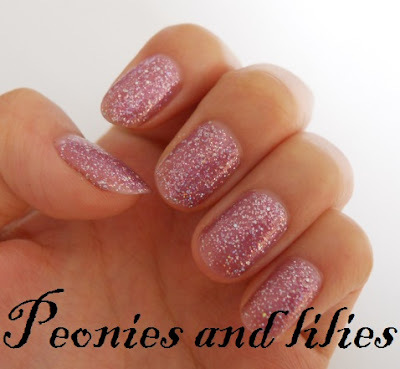 Are you a fan of glitter polishes? What do you think about the new colour? I like glitter polishes but not when they're all bobbly. This one has a nice sheen to it and really good colour too. This is gorgeous :) The glitter looks like the perfect size !!! Wow, great amount of glitter in this!